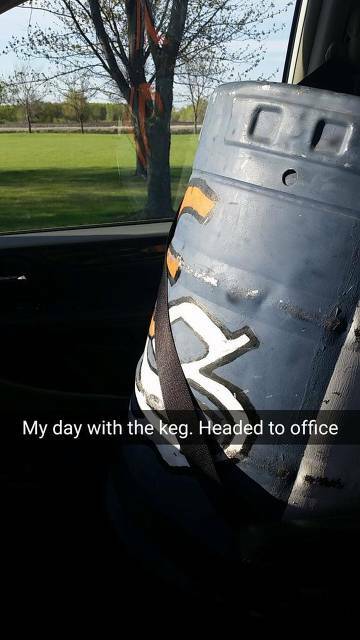 KEG IS SAFE FOR THE WINTER! 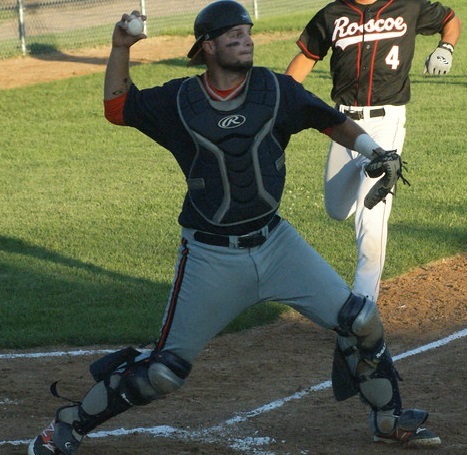 NEW PRAGUE--One bad inning ended Elrosa’s season Sunday in a 9-4 loss at New Prague. The Saints had an early 4-1 lead in which they drove the Sleepy Eye starting pitcher from the mound. Kevin Kuefler (2-5) opened the bottom of the first with a double off the top of the wall and Cody Eichers had a one-out RBI single to give Elrosa a 1-0 lead. In the third inning Kuefler singled to start a second rally. After a walk to Jackson Peter, Matt Schmitz singled and James Kuefler doubled giving Elrosa its four-run lead. The fifth inning was a blessing for Sleepy Eye but a nightmare for Elrosa. New Prague scored eight runs that inning, only one earned. Three of Sleepy Eye’s five hits came in that inning, as did two of the Elrosa’s errors, a hit batter and a walk. After that inning Sleepy Eye had only two other batters reach base, one of them taken out on a double play. Ethan Vogt was charged with the loss. Brad Mergen, drafted from Farming and Aaron Vogt pitched the final four innings. Kevin Kuefler 2-5, 2B, 2R. Jackson Peter 0-4, R, BB, K. Cody Eichers 2-5, RBI. Ethan Vogt 2-5. James Kuefler 1-5, 2B, R, RBI, 2K. Matt Schmitz 2-4, 2R, 2 RBI, 2-2B, HBP. Derek Wiener 1-5, K. Brandon Roelike 2-3, HBP. Austin Imdieke 0-3, BB, 2K. Aaron Vogt. Ethan Vogt (L), 4 2/3 IP, 5H, 9R, 2 ER, 2BB, 2K. Brad Mergen 2 1/3 IP, 1 BB. Aaron Vogt 2 IP, 3K. 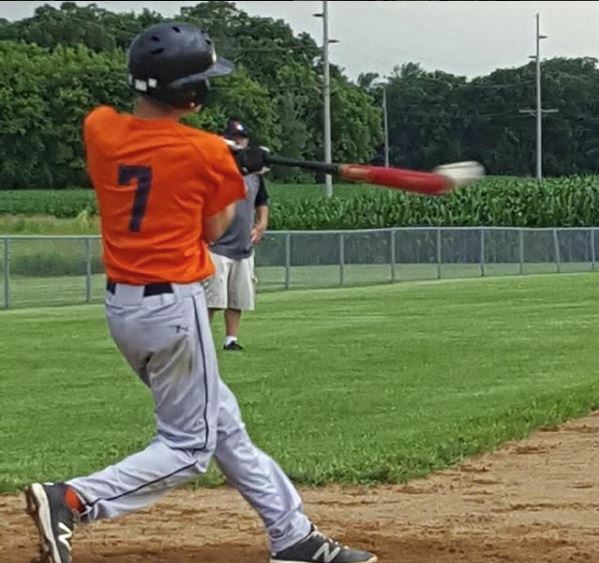 FARMING--Ethan Vogt and Austin Imdieke combined to shut out the Richmond Royals in the winner's bracket of the Region 15C playoffs Friday night in Farming. Vogt pitched 7 solid innings to earn his second win of the tourney while Imdieke shut the door in the final two innings to secure the victory. Cody Eichers continued to hit the cover off the ball with a 4-5 performance including a 3 run home run and three runs scored. Elrosa ripped 12 hits during the contest while the Saint's pitchers only allowed four base hits. 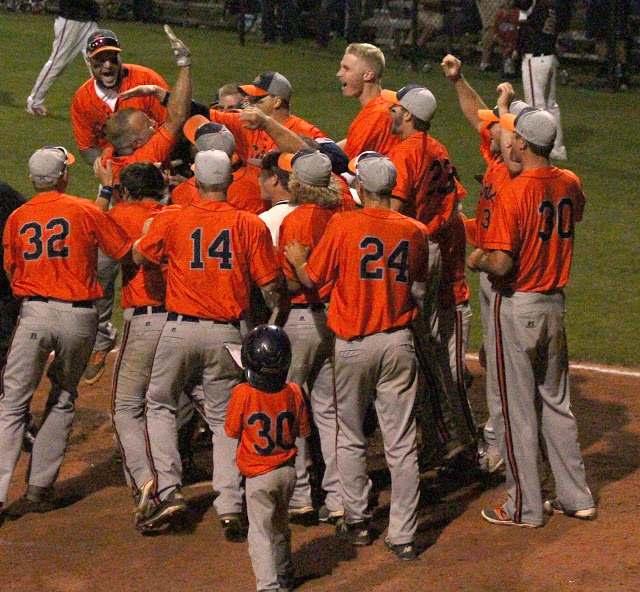 The navy and orange now sit in the driver's seat of the Region 15C playoffs and await an opponent for the finals on Sunday at 1:30 p.m. in Farming. With a victory on Sunday, the Saints would clinch a #1 seed and a 1st round bye for the State tourney. FARMING--With the score tied 1-1, Cody Eichers stepped up and hit a solo home run to center field to give the Saints the 2-1 lead and Aaron Vogt make it stick as the veteran right hander shut down the Lake Henry offense as the Saints punched their ticket to their 3rd straight State tourney appearance with the victory. 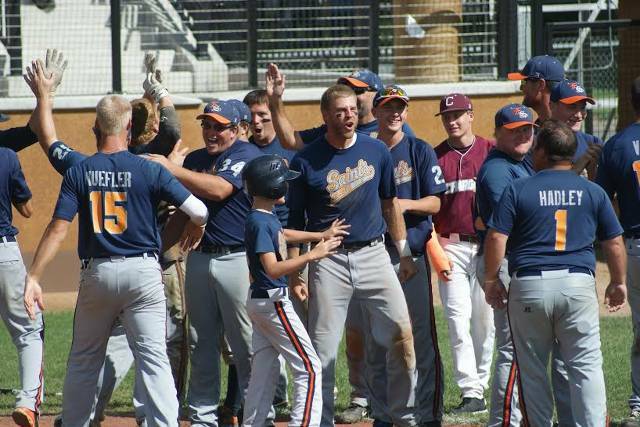 It was Eichers' second home run of the tourney and Vogt earned the complete game pitching victory behind solid defense, 5 timely strikeouts and 0 walks in yet another epic Region performance. Elrosa took an early 1-0 lead in the first inning on an RBI from Matt Schmitz which was quickly erased the Lakers responded with a run of their own in the early innings. A pitcher's duel would ensue as Carter Wessel and Aaron Vogt consistently pitched themselves out of jams in the middle innings. Vogt gave up 11 hits but struck out five Lakers in crunch situations. Kevin Kuefler and Derek Weiner each had nice diving catches in the outfield to help keep the lead intact. Eichers' bomb to center field was one of six hits for the navy and orange who advance to play Richmond Friday night in Farming at 8 p.m. FARMING--Elrosa knocked out 14 hits on their way to a 15-3 victory over the host Flames in the Region 15C opener Saturday night in Farming. Cody Eichers hit a home run and Jackson Peter blistered three hits to lead the Saints offensively. 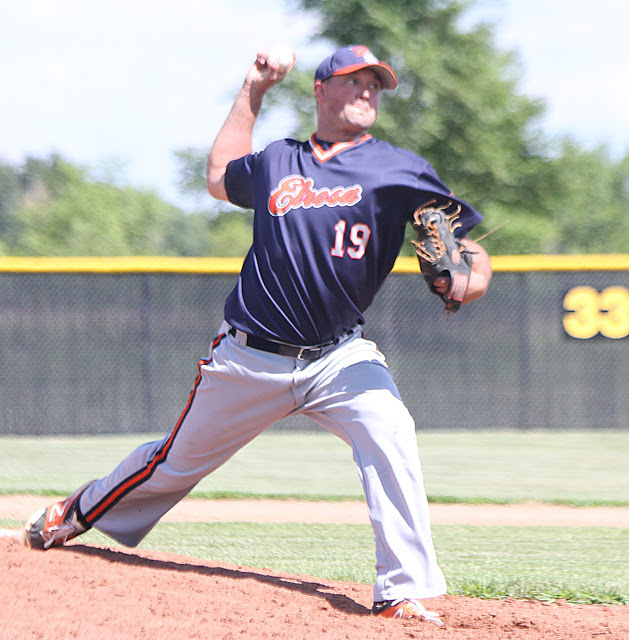 Kevin Kuefler reached base three times which included a double and a triple while Ethan Vogt labored through seven innings on the mound to secure the opening round victory. The navy and orange took advantage of 12 free passes from Flame pitching to earn the lop sided victory. 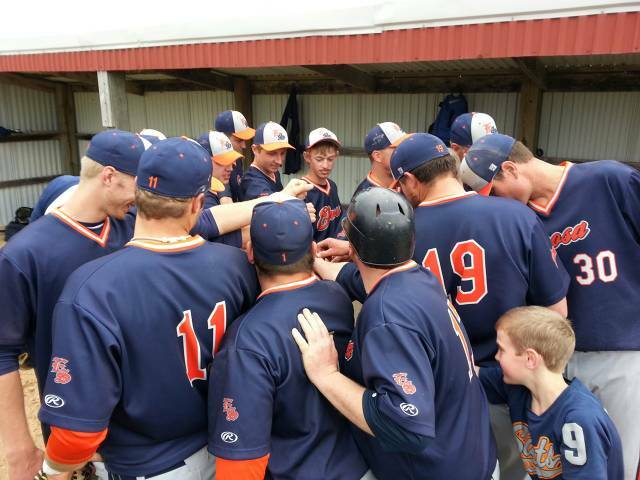 Sunday the Saints will play Lake Henry at 1:30 in Farming with the winner punching a ticket to State tournament.